Typical scenario: New patient comes in, we do the health history, discuss a few things, I recommend a full blood panel work-up to get started. The patient quickly informs me that they already went to their doctor and the blood work was fine. Fine? Then why do you feel the way you do and come in afflicted by x,y,z? Hmm. . . Conventional western medicine looks at things as black or white. You either have disease or you don’t. You’re either sick or healthy. If no evidence of disease can be found on lab work or other testing methods, you get a clean bill of health. But if that’s true, then why are you still symptomatic? Why are you gaining weight even though you’re dieting, or depending on coffee to make it through your day, or bloated and constipated? Why, if your blood work looks so good on paper, do you feel so bad? A functional medicine approach looks at things very differently. Emphasis is on the subtle shifts happening in the body and how they all connect. It looks for underlying causes of symptoms and disease. You see, the body was’t designed to malfunction. So when something does go wrong, when a symptom pops up, when pain persists, when you really just don’t feel well, these are all clues that something is out of balance and these symptoms are your body’s cries for help. Symptoms were designed to let you know that something needs to be addressed. Functional medicine looks to uncover the real issues. In other words, we look at the gray area where you’re not necessarily considered sick by conventional medicine standards but you certainly aren’t functioning in optimal health and would really like that to change. You know when the results come back from your blood work and there are these ranges on the right hand side of the page that are considered normal for each marker? You either fall within the normal range, or you’re too high or too low. Have you ever wondered how they figured out what “normal” is? 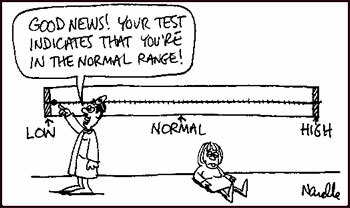 Basically, they run blood work on thousands of people who come through the lab, plot a bell curve of the results, and then take the middle 20% or so and consider that to be normal. But wait, would’t that mean that this “normal” range is just the average of all the sick people going to the doctor and having their blood tested? Yes, exactly! 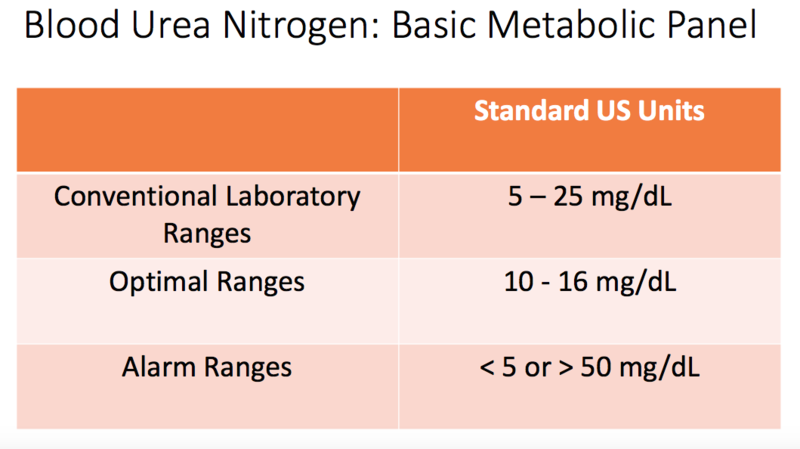 So normal does not equal health according to standard lab ranges. In addition, many of the markers will not shift (high or low) until your body is so far out of balance that true pathology is present. Your blood work comes back and your doctor tells you it’s fine. You bring me a copy and I take a look. 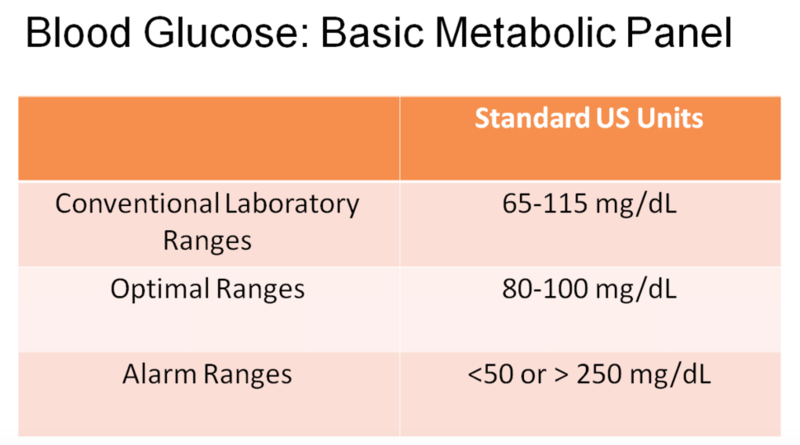 The first thing I may notice (hypothetical situation) is that your Fasting Blood Glucose is 110. Now, by conventional standards, this is considered what we call: Within Normal Limits. Your doctor may tell you you’re perfectly fine, no problem, keep doing what you’re doing. Next, I scroll down and see that your BUN (blood urea nitrogen) is a 7, which by conventional standards is fine, but not in my book. There are many differentials to consider here, so I keep looking and notice that Total Protein and Globulin are also low by functional standards. Now I can put all three of those markers together and strongly consider hypochlorhydria (low hydrochloric acid production and/or secretion) as a possible cause for these shifts. At this point, I would question you and possibly find that you suffer from frequent bloating, indigestion and constipation. So, I would recommend appropriate supplementation to improve your hydrochloric acid levels which would in-turn improve your overall digestion. Examining blood chemistry markers from a Functional Medicine perspective allows the doctor to identify subtle dysfunction in the body that may signal a need for dietary change, nutritional supplementation or even further testing. The advantage is clear: we are able to identify what’s going on with patients who have been seen by conventional medical doctors but found no answers to their health issues. We are also able to identify potential problems when they are easy to correct rather then once they have become full blown disease states. If you would like to have your blood work read along with recommendations for optimizing your health or figuring out your tough case, Dr Lisa offers an introductory rate of $99 for the analysis. If you haven’t had a full panel done, low-cost testing is also available. This speaks to me, would love to show you my blood work.